We ask that you vote as quickly as possible as the ballots will close on Nov. 21st. Candidates who are elected will be notified by November 25th so that they can make plans to attend the December 2nd board meeting. Vote by midnight on September 30th to make sure your voice is heard. In keeping with NCFR’s recommendation that affiliates review their Bylaws periodically, OHCFR board members Audrey Kraynak (past president) and Maureen Blankemeyer (secretary-treasurer) have diligently worked to update OHCFR’s Bylaws, which were last revised in December 2012. OHCFR Advisory Board members reviewed and discussed the proposed changes to OHCFR’s Bylaws at the July Advisory Board meeting. The changes are being proposed so that OHCFR’s Bylaws more closely follow the model for NCFR affiliates’ Bylaws. Any revisions to the Bylaws must be approved by at least two-thirds of the membership of OHCFR. Please vote at the following link: http://go.osu.edu/ohcfr_bylaws2016. Thank you for your continued participation in OHCFR! We look forward to seeing you at OHCFR or NCFR events in the coming year. At the March OHCFR Advisory Board Meeting, the board recommended the suspension of the annual presentation awards to undergraduate, graduate and/or professional members who are presenting at the annual NCFR conference until such a time as the OHCFR treasury is able to sustain these monetary awards. (Note: OHCFR funds come solely from the $5.00 NCFR rebate per member to affiliate councils that is based on the number of members who join NCFR annually.) Thus, there will be no call for proposals for presentation awards for the 2016 annual NCFR conference. Have you ever had to describe/defend what family scientists do? NCFR created a resource that might be helpful for that next conversation or job interview. Jin-kyung Lee was the recipient of the 2015 OHCFR graduate student travel award. Ms. Lee’s proposal received the highest ratings of the seven proposals submitted for consideration. 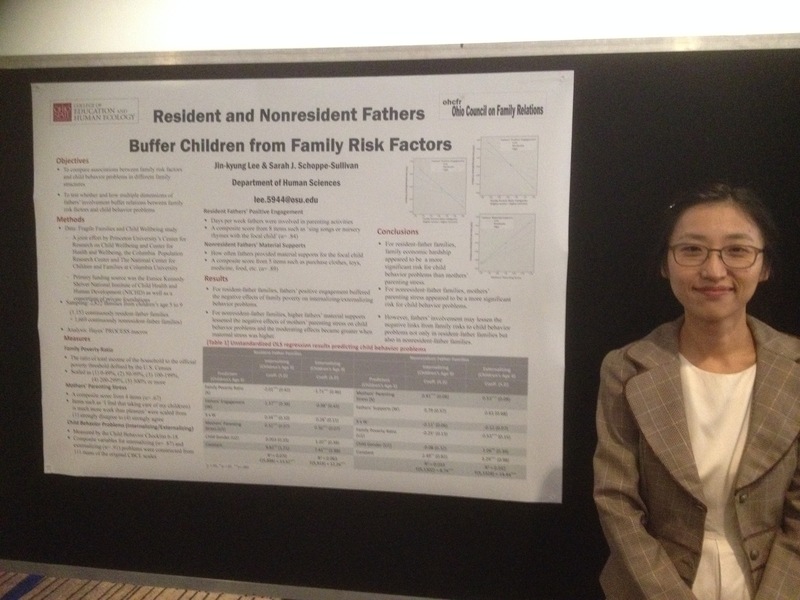 I appreciate receiving the travel grant from OHCFR to present my research entitled “Resident and Nonresident Fathers Buffer Children from Family Risk Factors” at the 2015 National Council on Family Relations conference in Vancouver, BC. Via this opportunity, I was able to receive helpful feedback about how to develop this research further in order to reveal moderating effects of father involvement to protect children from high-risk backgrounds. The purpose of my study is to directly compare associations between family risks and child behavior problems in different family structures, and to test whether multiple dimensions of fathers’ involvement have buffering effects on relations between family risk factors and child behavior problems. I hoped to broaden our knowledge about fathers’ roles in children’s resilience through this research and provide implications for interventions targeting father involvement. In the research, 2,822 families were sampled from waves 4 to 5 of the Fragile Families and Child Wellbeing study (FFCWB). Depending on fathers’ coresidence, two sub-samples were selected: 1,153 children resided with fathers continuously and 1,669 children did not live together with fathers continuously. I chose FFCWB because it is advantageous to investigate parenting behaviors for resident fathers as well as nonresident fathers in low-income families. I chose waves 4 to 5 because wave 4 was collected when the focal children were 5 years old and wave 5 was collected when the children were 9 years old so these waves were well-suited to capture the developmental process leading to child behavior problems. My study tested two factors as major family risks. One is family poverty, which was calculated using the ratio of total household income to the official poverty threshold defined by the U.S. Census Bureau. The other factor is mothers’ parenting stress, which was measured using four items such as ‘I often feel tired, worn out, or exhausted from raising a family’ or ‘I find that taking care of my child(ren) is much more work than pleasure’. As a protective factor, father involvement was measured in two ways. All fathers reported how often they were involved in positive engagement activities such as ‘sing songs or nursery rhymes with the focal child’ or ‘read stories to the focal child’ In addition, for nonresident fathers, mothers reported how often the nonresident fathers provided material supports (i.e., clothes, toys, medicine, food, etc.) for the focal child. Mothers reported on children’s internalizing (i.e., withdrawn, anxious/depressed, or somatic complaints) and externalizing (i.e., aggressive or rule-breaking) behavior problems. The results from regression and moderation analyses that I presented at the NCFR meeting indicated that (not surprisingly) greater family risk factors predict greater subsequent behavior problems among children. But, different mechanisms linking family risk to child socioemotional development appeared to operate for resident-father families and nonresident-father families. For resident-father families, family economic hardship appeared to be a more significant risk for children’s internalizing and externalizing behavior problems than mothers’ parenting stress. For nonresident father families, mothers’ parenting stress appeared to be a more significant risk factor for children’s problem behaviors. Even more interesting, regardless of family structures, father involvement appeared to significantly reduce the risks of family poverty and mothers’ parenting stress for child development, although there was a difference in which type of supports from fathers may be most helpful to buffer these links by family structures. Resident fathers’ engagement with children moderated the negative association between household income and child internalizing and externalizing behavior problems and these moderation effects became greater as poverty increased. Nonresident fathers’ material supports reduced the positive association between mothers’ parenting stress and children’s internalizing behavior problems, and this moderation effect was also greater when mothers suffered from higher parenting stress. By revealing more detailed mechanisms of risk and resilience in the development of child behavior problems in early childhood and common moderating effects of father involvement, I hope to provoke more research interest about fathering and provide more information about how to best approach and promote father involvement in different family structures. 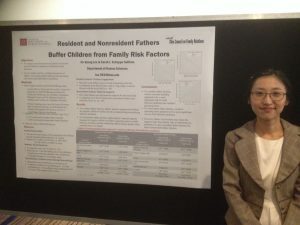 When I presented this research at the NCFR 2015 annual conference, it was interesting to see that many male participants visited and showed their interest in my results indicating that fathers can protect children from developing behavior problems in the face of family risks. I also appreciated that I could confirm the need for academic research about coparenting in diverse family structures and was able to receive some helpful feedback about including more demographic variables in this particular study. Hopefully, I can use this feedback to strengthen and further my current and future contributions to knowledge about fathers’ capacity to benefit their children and families. Our own OHCFR student board member Rachel Brown, an Ohio State University doctoral student, describes her 2015 NCFR Annual Conference experience.